So I have two Aspects: “Law-Abiding” and “Baron von Evil Must Pay”. At some point, there’s an interesting clash – we have a way to get at Baron von Evil, but it requires breaking the law. My Aspects come into conflict, and it’s exciting to discover which way I’ll jump. If one of them has a !, though, it’s not interesting any more. One critical point: the ! May be because while you, as the GM or an observer may find that conflict interesting, I as a player may not, and this makes it easier to communicate and respect that. Thankfully, it’s not like there’s a shortage of interesting opportunities in play – this just excises a subset the player doesn’t want to be leaned on for. I 100% got to the exclamation point idea before I got to the sidebar where you mentioned it. To which I say, hells yes. I’d also submit that you could combine them (no! 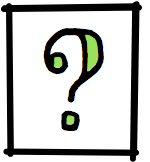 I am not talking about an interrobang, use both dammit), so for example “Faithful? !” would imply that the paladin behaves in an absolute way, but it’s brittle, and eventually someday it will be tested in a way that causes that absolutism to shatter. I can also see the modifiers changing under specific circumstances. In the TV series Due South, Benton Fraser is either “Helpful” or even “Helpful!” He’ll drop whatever he’s doing to aid a person in need. He looks at her sadly. “No, ma’am, I’m afraid I can’t.” And he drives away. Fraser has been my go-to touchstone for paladins ever since I first saw Due South. Loved that show. And rightly so. Thank you kindly. Now I want to get out my Box Sets and do a full rewatch. This is some nice tech, I like it. I’m thinking that periods and ellipses might be useful as well. “Honorable…” conveys a “but” – this character is honorable, but there are definitely exceptions. In other words, you don’t want a scenario in which those things are central to the conflict, you don’t want to explore them, they’re established and they’re real and that’s all they are. It’s a really cool idea and I think it aligns with your suggestion for the use of the ! as a partner to the ? from Over the Edge. Interesting. Often I find that when we highlight something in backstory, it’s because we WANT the GM to be able to draw on them to find things that will particularly matter to us, and make a conflict personal.